Web Analytics — Follow the move! Real Time Analytics analyses the multiple channels acquisition about past and real time traffic to give you accurate projections about future traffic on your website. This is the perfect measure tool to maximize your ROI. Using Real Time Analytics is simple and performing. This Web Analytics makes you discover your website from another point of view: grow your performances thanks to the auto-segment (sources, pages, systems and locations) and roadblock (automatic analysis to define segments to be optimized) views. REAL TIME ANALYTICS is based on google analytics’ data and uses Google+ Sign-In, fast and secure, to provide easy setup: just click to try it. From Google Analytics’ data we create the trends, analyse roadblocks and provide you the real time multi-sites view. The tool simply collects the stats of the GA’s code which is already on your website, no more needed. Create your account with Google+ in one click and access all the Real Times Analytics’ features immediately. No spam promise - only latest news ! Real Time Analytics provide a list of segment to optimize or falling for your websites. It's an advise for a device (mobile), a source (Google organic) or a browser etc. You can also discover your roadblocks for a goal (roadblocks for micro/macro conversions). 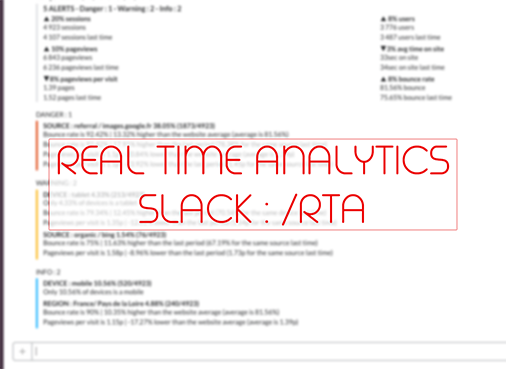 Slack /rta command let you access KPI's, roadblocks and trends of all your websites directly in your Slack. Share Real Time Analytics with your team ! The dashboard is multi-websites, You'll get the real time of all websites on the same page. Using an algorithm, Real Time Analytics indicates the number of current day visitors. Discover your site from another angle! Access an original view of your history. 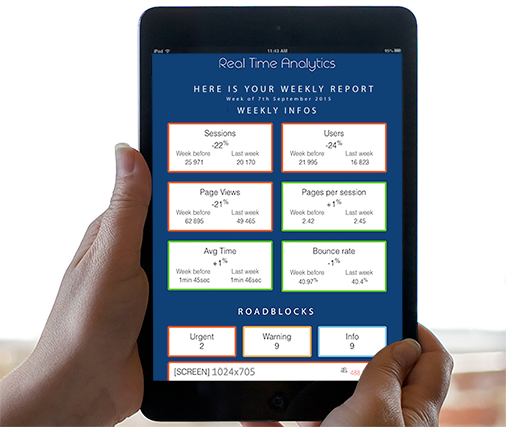 Receive a scheduled analytics email report for your website (KPI's + roadblocks). An automatic analysis of your website shows the priority segments to optimize. A regularly updated set of tools at your disposal and algorithms is performed. We build tools based on your feedback and your desires. We remain at your disposal ! The automatic segmentation system visitor extracts important informations. Analytics email report is a useful overview. Real Time Analytics help us to improve our site in terms of accessibility and acquisition. Roadblocks report have confirmed my affiliate partners issues in a second ! DISCOVER YOUR ANALYTICS REPORT NOW! More than 2000 websites use Real Time Analytics Beta, give it a try for free ! REAL TIME ANALYTICS is in beta, follow us to get inform about advancements and new features. We look forward to your feedback to evolve with your needs and ideas. The team thanks you for your feedback.